The 30th anniversary edition of the South Nyack 10-Mile Race on September 9 promises runners a scenic out-and-back course highlighting the pristine beauty of the river villages of South Nyack, Grand View and Piermont. Participants chart a route parallel to the Hudson River with a turnaround at the end of the mile-long Piermont Pier. The last nine-tenths of a mile traverse the earthen Mayor Raymond Esposito Rail-Trail, finishing near the start at Franklin Street Park. It was Mayor Esposito’s brainchild back in 1978 to hold a 7.8-mile run to commemorate the centennial of South Nyack’s incorporation as a village, 1878-1978. 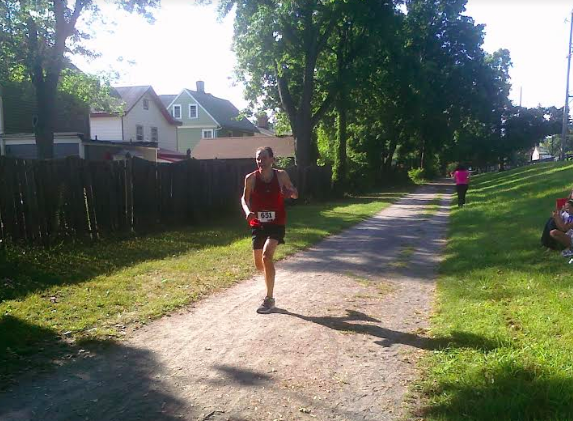 The local running community embraced the quirky distance and the sweeping vistas of the course. The race was contested for 10 years at the 7.8-mile distance, administered by the village of South Nyack, before being reincarnated as a 10-miler in 1989 (after a one-year hiatus) when the Rockland Road Runners took over as race coordinators. This year marks the 30th running of one of Rockland’s most popular and well-attended footraces. The two constants throughout the event’s annals have been the flawless weather – it has never rained during any of the previous 29 outings – and the success of Art Gunther. Gunther, a 47-year-old former Tappan Zee High School standout, has won the race an incredible 20 times in 23 attempts. The Binghamton University Hall of Famer finished an uncharacteristic third place last year, but has been training well and hopes to rebound back to the winner’s circle this year. Born and raised in Blauvelt and now an Upper Nyack resident, Gunther cuts a willowy figure well-familiar to users of the roads and trails throughout Orangetown. Course records for the USATF-certified layout are 50:01 (a 5-minute mile pace) by Darrell General in 1992, and 59:07 by Claudia Camargo in 2007. Neither record is expected to be challenged. Race proceeds benefit the South Nyack and Piermont volunteer fired departments, the Rockland Road Runners’ Scholarship Fund, and Nyack soup kitchens. The events has raised thousands of dollars over the years for various worthy causes, such as Junior Achievement, Camp Venture, St. Agatha’s Respite Care, St. Dominic’s Home, Rockland County Friends of Autistic Children and Rockland County Association for Children with Learning Disabilities. The 10-Miler steps off at 8:30 a.m., preceded by the children’s fun runs at 8:15 a.m. For further information, e-mail SN10@rocklandroadrunners.org or kdrunner2002@yahoo.com.